It has been raining for a week, and Lum is not happy with how fat Ataru has become in his sloth. 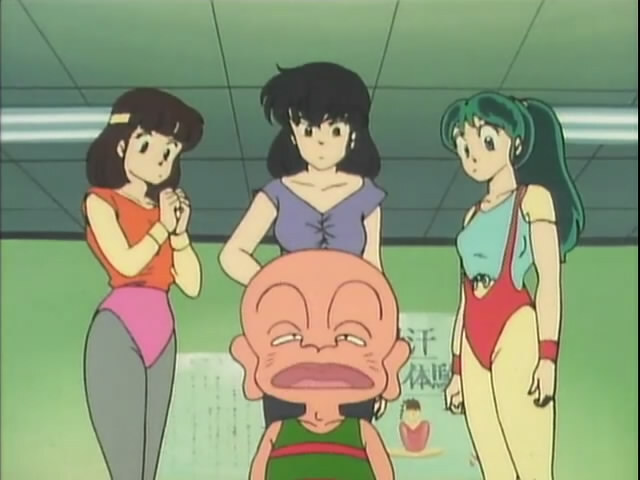 As such, she suggests they take a yoga class, which Ataru readily agrees to since there should be women there. Upon arriving at the building with the class, they are surprised to see the receptionist is none other than Kotatsu-neko. They pay their ¥1000 entry fee and find Shuutaro, Shinobu, and Sakura also there, all with their own reasons for attending. 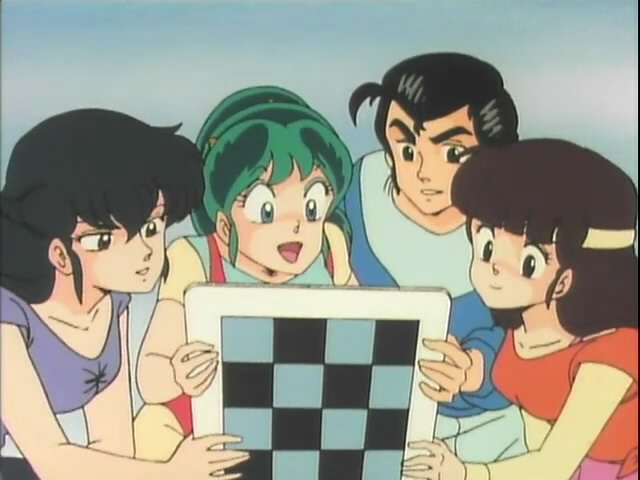 The teacher enters and proves to be none other than Cherry, frustrating them all and leading Ataru to state that he should have guessed based on Kotatsu-neko being the receptionist. However, since the fee is non-refundable, everyone stays. Cherry has Shuutaro cling to a tree and Ataru press against a wall, but it is a ploy to remove the guys, so they give him a beating and then string him up in the light bulb pose. They find a yoga book and attempt to do the stuff there, but it is harder than expected, leading them all to be in greater pain. Cherry emerges triumphantly, so Sakura prostrates herself to Cherry to have him teach them. Shuutaro doesn’t like this, but Sakura reminds him of the ¥1000. So, her hope is to get their money’s worth. After some debate, the group agrees and Cherry has them do “group yoga,” whereby they are piled up and forced to meditate in a human tower of sorts. While meditating, the group finds itself flying and they land on an island with a massive roulette wheel and a “Start” banner. 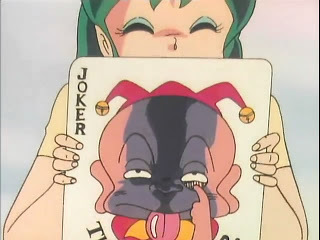 Cherry explains that this is a game where one’s dreams can be achieved, but they will have to have a card battle before it can be achieved. 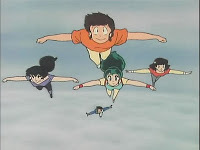 Sakura’s fantasy is to go on a cruise with Tsubame, but it turns out to be Ataru, who defeats her and takes her cards. 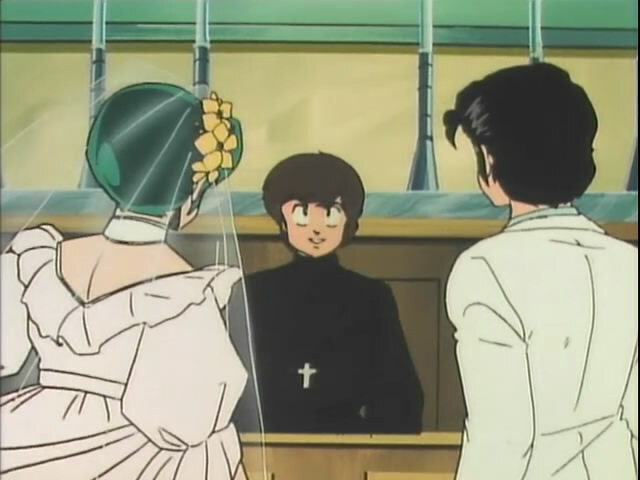 Shuutaro dreams of marrying Lum, but the preacher turns out to be Ataru and he defeats Shuutaro. 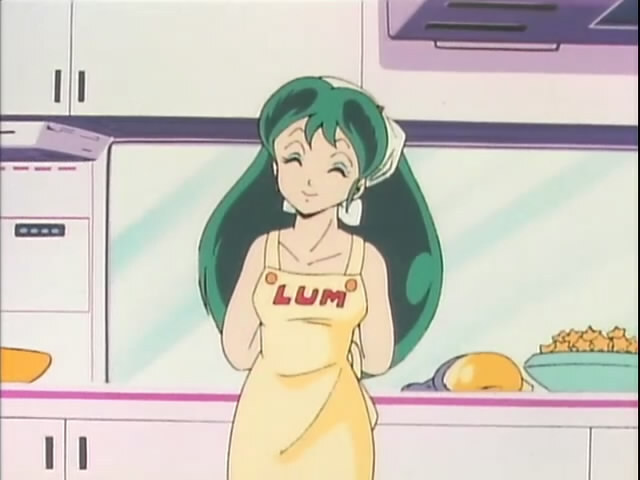 Lum’s dream is to be Ataru’s housewife and mother of his kids, but Ataru defeats her. Finally, Shinobu dreams of being Snow White, rescued by Shuutaro, but Ataru arrives and defeats him. 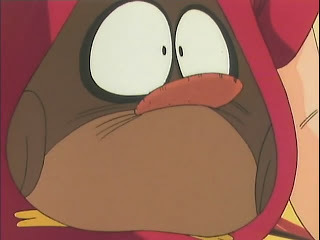 Cherry observes Ataru’s victories and has a bad feeling about things. Meanwhile, the vanquished Sakura, Lum, Shinobu, and Shutaro are back on Start Island, and are not happy with Ataru for destroying their dreams. 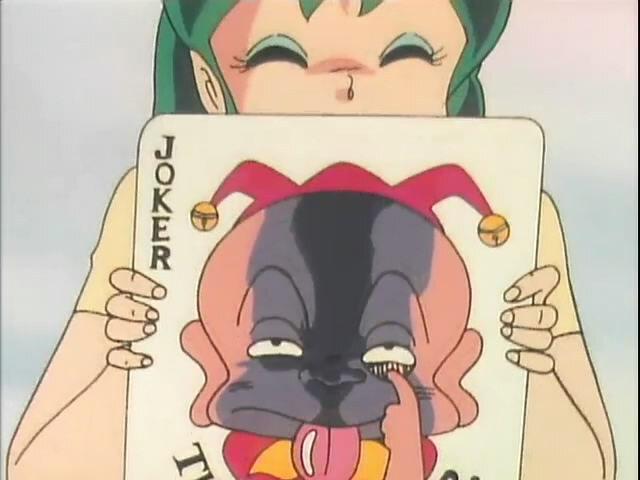 Shinobu finds a single, remaining card on the island and with it, the group decide to go challenge Ataru. They find Ataru creating his perfect, harem island and when challenged, Ataru feels he can’t lose. He pulls the Ace of Spades, but they have The Cherry Joker. Thus, Ataru loses and is forced to be on a tiny island alone with the others have a relaxing time. 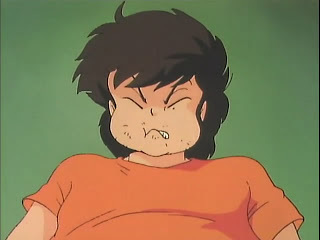 Ataru gets angry with everyone while in reality, he begins getting bigger on top of the others. Cherry decides to leave now before Ataru wakes up and beats him. The first half of the anime is the funniest, with Lum pointing out Ataru’s gut by “feeding” the owl on his shirt a cracker made me laugh out loud. I actually thought he might have had some weird alien on him at first, which is what made it funnier. 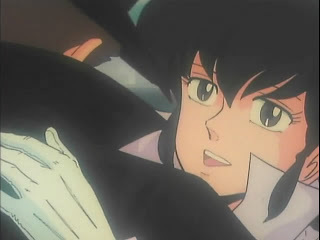 Cherry showing up was expected, as was the beating he took from Ataru and Shuutaro. 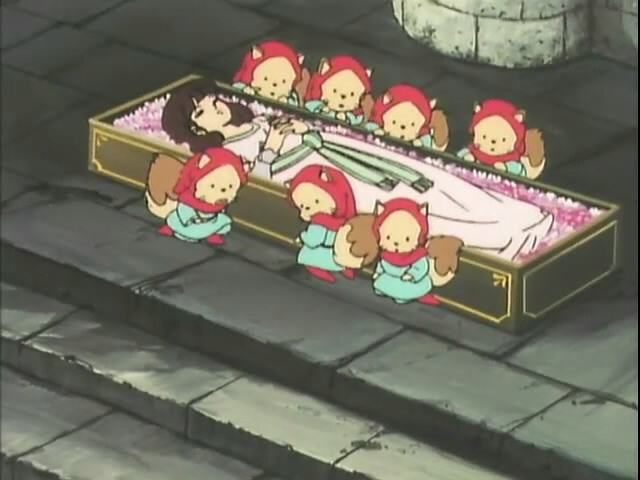 However, I found it amusing when Sakura prostrated herself before Cherry and got the others to go along as well. Shuutaro’s dream was predictable, but though I expected Ataru to be the preacher, it was still funny actually seeing it happen. Lum’s dream is expected since she would love to be a housewife with Ataru’s children. So, in the end, a fun and humorous episode. Wow. That is going back.